Wanna see my new business cards? 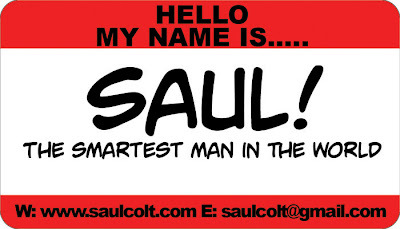 I have been thinking of printing some Business Cards for a while…..sure I have my work cards but I don’t have any “SAUL” cards for networking and meeting girls in bars. So here is what I have come up with…..and I am keeping the back a secret since there are 5 different versions. You will have to meet me to see the back! I love cool business cards so if you have an unusual one drop me a note…I would love to see it! Having seen the cards first hand now, I can attest to both their creativity and coolness.